Christmas Prezzies, from three euro to 3.5k euro! from three euro to 3.5k euro! 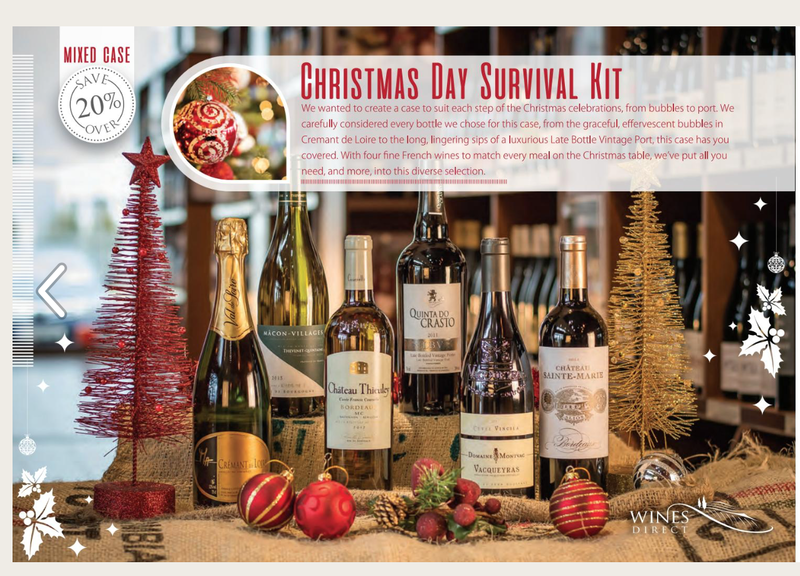 First aid from Wines Direct! Wines Direct make Christmas Day easier for you with their Survival Kit. Along with two classic French whites and two classic French reds, you’ll get a bottle of sparkling wine (Cremant de Loire by Alain Marcadet) and, for afterwards, a bottle of Port (Quinta do Crasto LBV 2011). It is available online at Wines Direct and the six bottles will cost you €115.00 (over 30 euro off and free delivery). 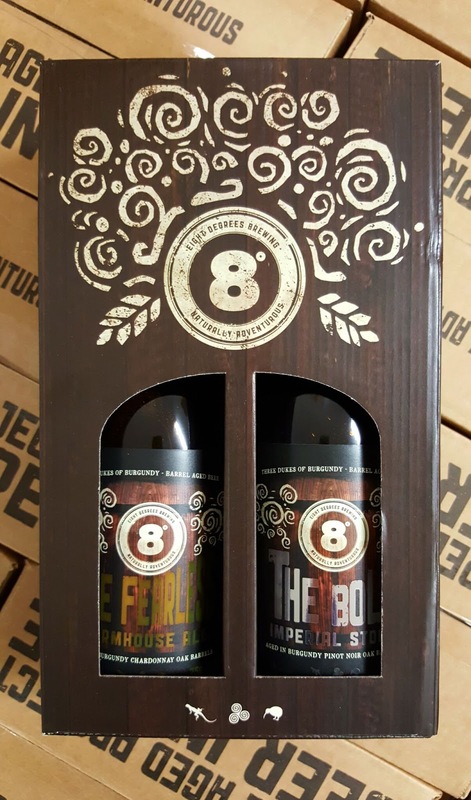 All of these limited edition beers are bottled into 750ml amber champagne-style bottles and are available either individually or in 2 x 750ml bottle gift packs (RRP €19.95). Fearless Farmhouse Ale is your perfect Christmas table beer. It won’t shout too loudly over the turkey, will happily hang out with ham and doesn’t balk in the face of any cranberry relish-type shenanigans. Want to read up on your whiskey? Then get Peter Mulryan’s Whiskeys of Ireland. 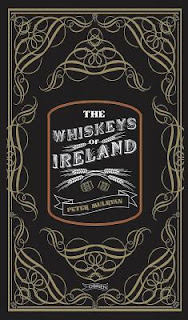 The very experienced Peter (the man behind the Blackwater Distillery in Waterford) knows his whiskey as well as his gin and the book charts the history and the current state of Irish whiskey. A very intertesting read indeed. 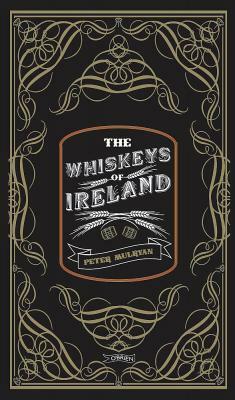 The Whiskeys of Ireland is published by the O’Brien Press and is widely available. I spotted it in Bradley’s, North Main Street, Cork selling for €19.95. While you’re reading, why not sip from either The Teeling 24 or 33 Year Old Single Malt, available initially in the Teeling Whiskey Distillery, Celtic Whiskey Shop and Dublin Airport in Ireland and retailing for €300 per 70cl for the 24 Year Old and €3,500 per 70cl for the 33 Year Old. Too expensive? Well you can get a perfectly good bottle of Jameson for thirty euro or less! Another favourite around here at the moment is Writer’s Tears, also in Bradley’s at €45.99. Have you a wine lover in your life? But don’t know which wine to buy for him or her. Why not make a present of some suitable glasses instead. Tipperary Crystal have just produced a new range for white and red wine, for bubbles, and also for whiskey and brandy. Prices are mainly twenty euro for a gift box containing a pair of the glasses. All the details here. Wine and cheese go together of course and so too do beer and cheese. You can get all the best pairings and so much more in this massive just published (December 1st) book on cheese. Lots of Irish interest too with Cashel Blue, County Cork and pioneer cheesemaker Veronica Steele covered in this landmark encyclopaedia, the most wide-ranging, comprehensive, and reliable reference work on cheese available, suitable for both novices and industry insiders alike. See more here. Published by the Oxford University Press, the impressive volume costs forty pounds sterling. The producers are so happy with the complexity and smoothness of this milk based gin that they really enjoy sipping it with a “splash of water”. But they add “she works very well with a good quality tonic”. And she performs well also in a martini. Bertha, shaken with ice and a suggestion of vermouth, poured into a chilled glass with a simple zest garnish delivers “a gloriously smooth and precise cocktail experience”. Try it for yourself - stockists here - about 50 euro per bottle. O’Donovan’s 14th Cork Wine and Craft Beer Fair. Some Superb Spirits too. 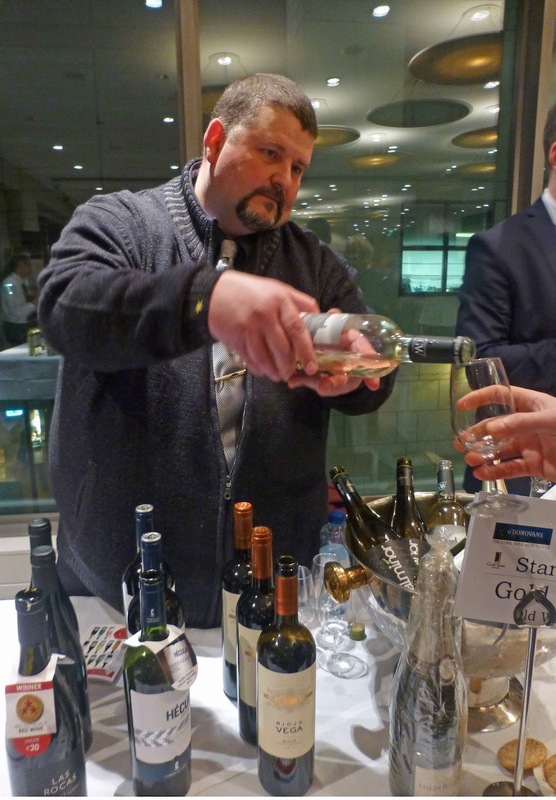 I must say I really enjoyed the variety around the room at the 14th Cork Wine Fair, mounted by O'Donovan Off Licences, in the Clarion last weekend. There were more than a few excellent wines, as you might expect. No shortage of good craft beer and some delightful Irish spirits. Not to mention the local food stalls. Traffic problems delayed some exhibitors and pundits but Mary Pawle, all the way from Kenmare, was one of the first to set up and my first visit. And her first offering was the biodynamic Dominio e Punctum Viognier 2015. Well balanced, great acidity and she suggests trying it with Asian Cuisine. Should have had toddled over to the Green Saffron stall! Grüner Veltliner is a favourite of mine and Mary has a good one in the Diwald Grossriedenthaler 2015, dry and rich, with great length. 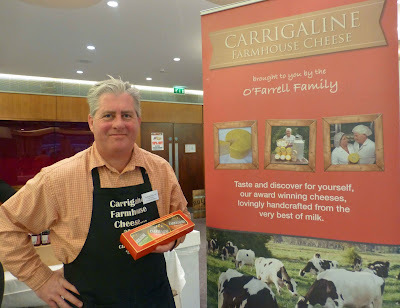 Time then to touch base with Padraig from Carrigaline Cheese, one of the Cork cheesemakers featured in the Oxford University Press Companion to Cheese, due to be published this Thursday. Avril of Rosscarberry Recipes had her problems with the traffic but she arrived with lots of samples, including a new one by son Maurice who has been working on an unsmoked Angus Biltong, a delicious product with lovely texture and flavour. Early days yet but this could be another winner from the Rosscarberry farm. Then I got side-tracked by some spirits, including Kalak the Celtic queen of winter. If people tell you that Vodka has no character, then give them a drop of Kalak. “We are very proud of this,” said Damien on the Tindal stand. “Enjoy it in a whiskey glass with a lump of ice. It is made from a single ingredient (malted barley) in a single distillery (West Cork) and only one of six vodkas in the world to be so made and recognised.” It is being sold in all the best places - the Germans love it and is going down well in the US. Tindal’s were also tasting the Blackwater No 5 Gin. 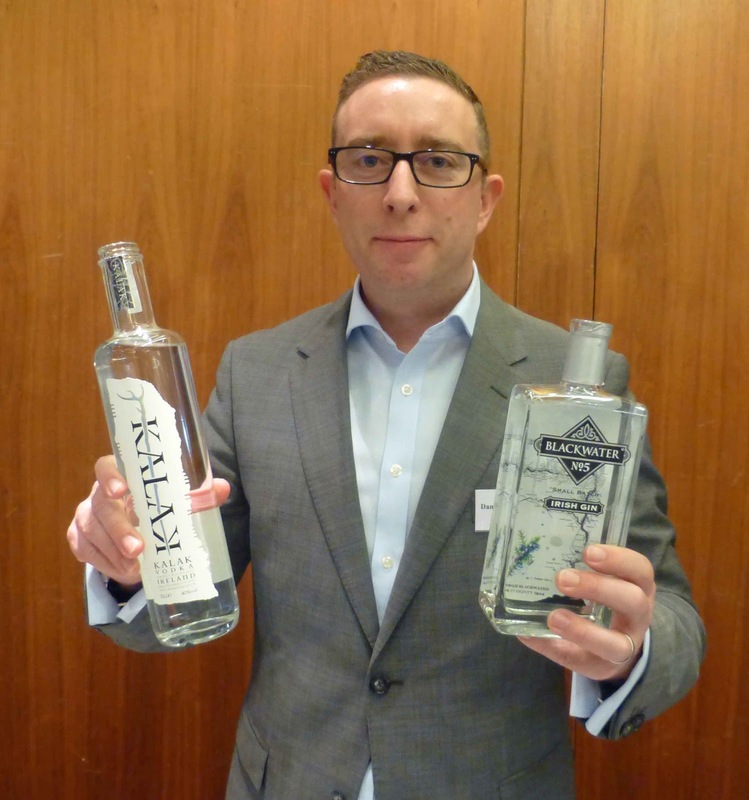 But my eyes were on their Juniper Cask Gin. I remember seeing those small juniper casks before they were filled but had never tasted the result. Damien fixed that. As many of you know by now it is a delight, amazing aromas and flavours. There were some very enthusiastic people behind the stands. 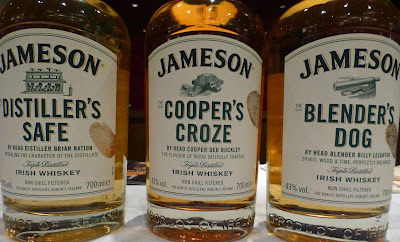 Jamie Winters of Irish Distiller was one and he treated me to a Jameson masterclass that included Blender’s Dog, Cooper’s Croze ad Distiller’s Safe. Each is made by a senior person in Midleton and each has the fingerprint on the bottles. Indeed, I’m told there’s quite keen competition between the three. My first sip came from the Distiller’s Safe by Head Distiller Brian Nation. His aim was to show the character of the distillate. Despite the wood that follows, the pot still has the first say and it certainly does here in a light and zesty, gentle sophisticated whiskey. 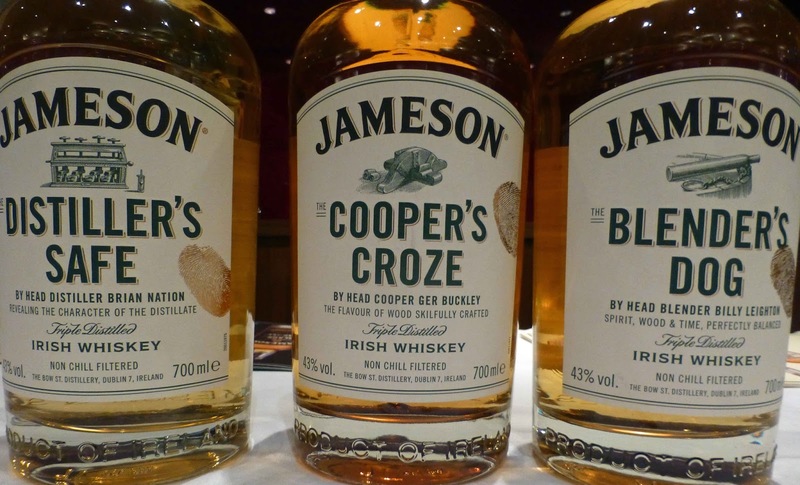 Head Cooper Ger Buckley was on the darker side, revealing the flavour of the wood so skilfully crafted. Not just the flavour. There is more colour here too and a great mix of fruit, spice and oak with a long and pleasant finish. That left it up to Head Blender Billy Leighton to bring it all together, the spirit, the oak and time. And he surely got the balance spot-on. Superbly balanced, sweetness and spice. 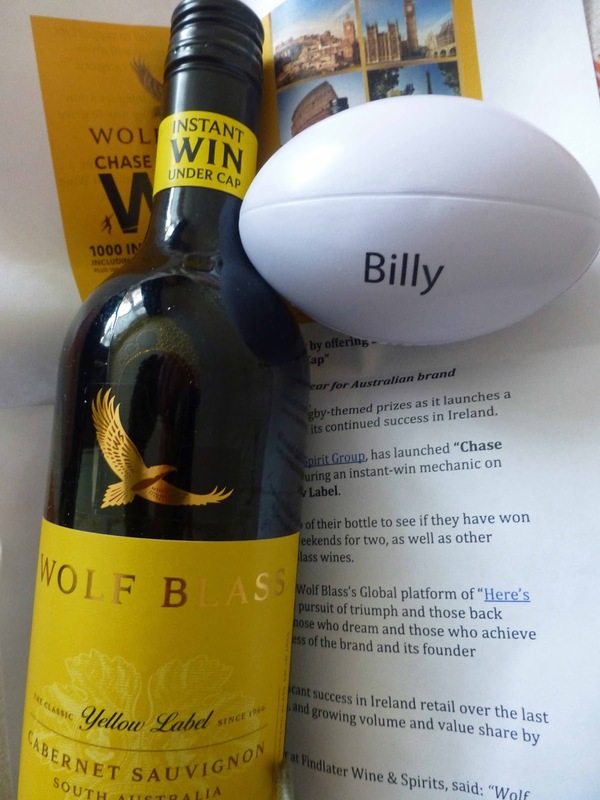 Time and patience pays off for Billy. It is rich and round, the gorgeous fruit slow to fade in the final. Major enthusiasm too at the Vineyard stand where we got stuck into the Malbecs! It was Argentina all the way and first up was the Pascual Toso 2014, a “sincere” and satisfactory example. But that was soon eclipsed by the Reserva 2014, super ripe with lots of complexity, very very good indeed. Next thing we knew, our man vanished and returned quickly with another Malbec, this the Luigi Bosca Signature Malbec Reserva 2012. Like all the previous Malbecs this had a lighter colour than you’d normally find in Cahors. It was smooth and silky and with a great finish. “Magic!” according to our man. Magic Malbec indeed. 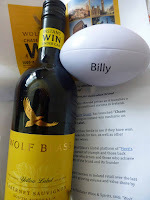 This had come from the Barry & Fitzwilliam display where we’d earlier been sipping beers by Bo Bristle and Mountain Man. 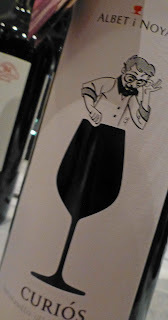 He went missing again and was back in a flash with a sample of the amazing Zenato Ripasso (from the Tindal stand). I’m a Ripasso fan and have tasted quite a few but this Zenato Ripassa della Valpolicella Superiore 2012 is silky smooth, with amazing concentration and a long long finish. “Dangerously easy to drink,” said Damien when we returned to the Tindal stand. Damien is a huge fan of the wine and the man behind it. And he had a suggestion for the Christmas dinner: the Zenato Valpolicella Superiore 2014, full of character and flavour and easily able to stand up to most the variations on the Christmas table. And we finished here with a sip of the Cotes du Rhône Les Deux Cols “Cuvée d’Alize” made by Simon Tyrrell. A blend of Grenache, Syrah and Cinsault, it was made for easy drinking and, with its rich fruit aromas and flavours, it certainly hits the mark. And we just had to try the Beefsteak Meaty Malbec 2015 at the United Wines stand. Well we were under orders! This vibrant Malbec, spicy and juicy, rich from the oak, is ideal - you’ve guessed it - for juicy steaks. And believe it or not you can join the Beefsteak club online! Pat, well known to patrons of O’Donovan’s in Mayfield, is a big red wine man and he showed us two of his favourites. 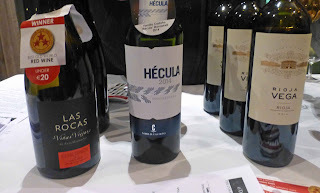 First up was the Famila Castano ‘Hecula’ Monastrell 2014, a Gold Star winner (under €15.00) at the Irish Wine Show. “Deliciously ripe and opulent, a steal” said the judges. 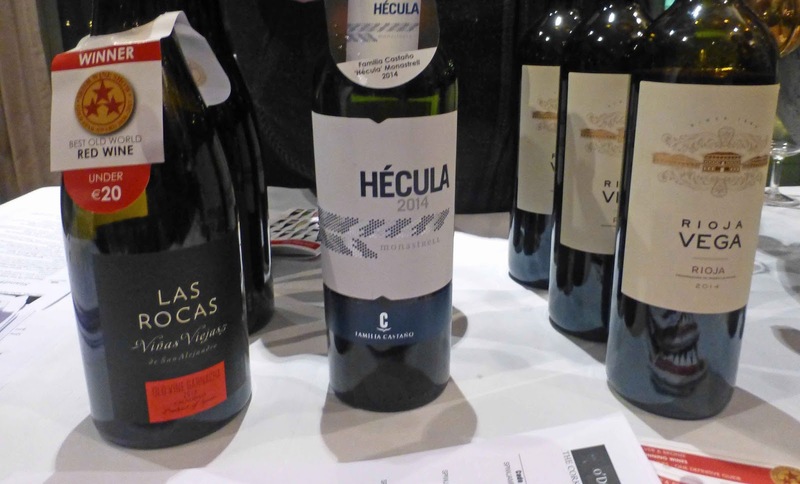 And I was very impressed with the next one: San Alejandro ‘Las Rocas’ Vinas Viejas 2013 from Calatayud. This won the Gold Star for reds priced under €20.00. And speaking of this old vine wine, the judges said: “..blackberry and mocha fruits with a side order of toast!”. We finished where we started, back with Mary Pawle. We enjoyed the Stellar Running Duck Cabernet Sauvignon from South Africa and a young unoaked Rioja Osoti 2015. Osoti by the way means pigeon in Basque so maybe that’s a matching hint. And she also had a young Côtes du Rhone, the Contrefort du Delta 2014, very pleasing aromas and palate, soft and smooth, and described as “a good all rounder”. All three were very good but my favourite of her reds was the Jean Bousquet Malbec 2015 with its intense aromas and flavours, soft and supple and with excellent length. Malbec again! Looks like it was the number one grape at the Fair, a very enjoyable few hours indeed. 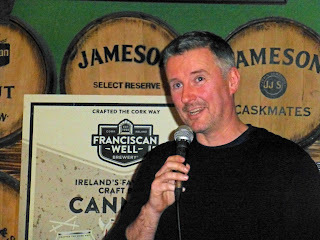 Franciscan Well's Shane Long: Now, we can! 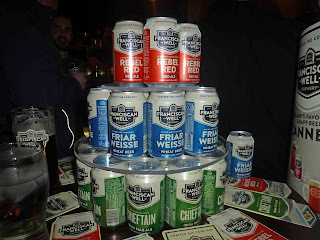 No shortage of craic in the Franciscan Well pub on the North Mall last week when the local brewer officially launched their new can range in Cork. Three of their favourites, all tried and tested, are available in the new format: Friar Weisse, Chieftain Pale Ale and Ireland’s number one* craft beer Franciscan Well Rebel Red. 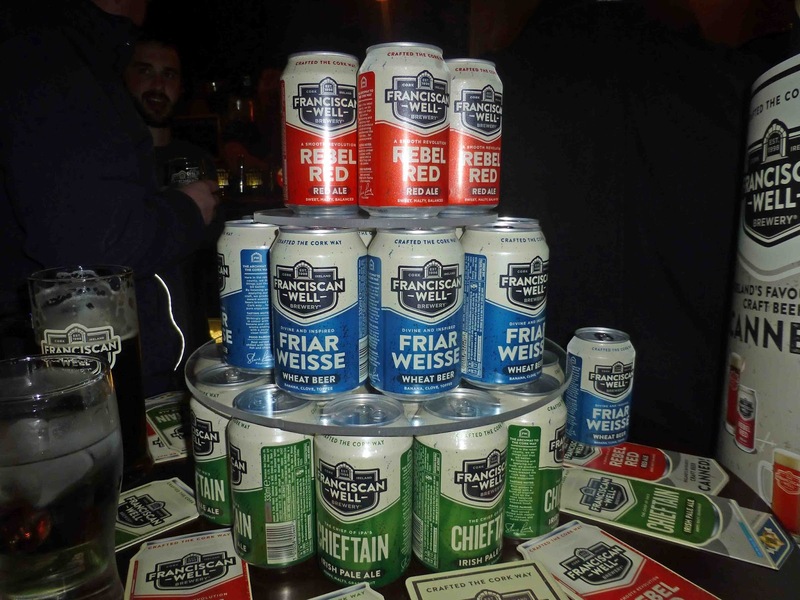 The announcement marks the first time Franciscan Well, which is brewed in Cork, has canned any of its beers and also the first time that Friar Weisse or Chieftain IPA will be available for purchase in off-licenses. Founder of Franciscan Well, Shane Long (right): "The decision to move to a canned format reflects the growing trend internationally, whereby more and more craft beers are sold in 330ml can format. This is something that has been prevalent in the U.S. and has proven extremely popular. We are confident this will be the case as we roll out craft in a can for beer-lovers here in Ireland, making our award-winning range of beers even more accessible and readily available.” The new cans also chill quickly and are recyclable. All brewing and canning will take place at Franciscan Well’s new brewery in Cork City. The brewery opened last year, allowing for operational growth and further expansion for Ireland’s leading craft beer brand, while staying true to Franciscan Well’s proud history and identity as one of Ireland and Cork’s favourite craft beers. The nearby North Mall brew-pub and home of Franciscan Well will be used an innovation centre, while remaining a popular destination for tourists and locals alike. There was a pre-Christmas feel to the bar as we walked in to be welcomed with a choice of cans, of course. Must admit we both picked the Chieftain, a favourite here since it was launched. And later, I switched to draught and again couldn't resist that Chieftain! Next time, though I renewed acquaintance with the wheat beer, Friar Weisse, with is distinctive colour, aroma and flavour. The Friar (left) was one of my early Well favourites and, after the other night, it is going back on my short list. It wasn't just beer on the night. The place was packed and there was music galore and no shortage of pizza either. Pompeii Pizza have a permanent place here and I saw why when I ordered one of their offerings, with Chorizo and Mushroom toppings (€11.00). Enjoyed every little bit. Check out the pizza, the music (including trad sessions), the tours and tastings on the website here. The new cans also chill quickly and are recyclable. And keep up to date on their Facebook place. Carrot, Parsnip, and brilliant Beetroot! All ready for roasting. Back in the 90s, on a holiday in the South West of France, we came across a brilliant traiteur but he wouldn't let us have the harissa for his couscous until he was sure we understood it was “très fort” and he got his embarrassed teenage son out-front to reinforce the point with his school English. Very strong or not, there was no bother getting it last Saturday or indeed any day in Cork. Just call into Mr Bells (as we did on return from that holiday) and pick up a tube of the spice. We needed it for a recipe in Taste the Middle East, a recipe booklet produced by Glenisk Yogurt and the Tang Restaurant in Dawson Street, Dublin. 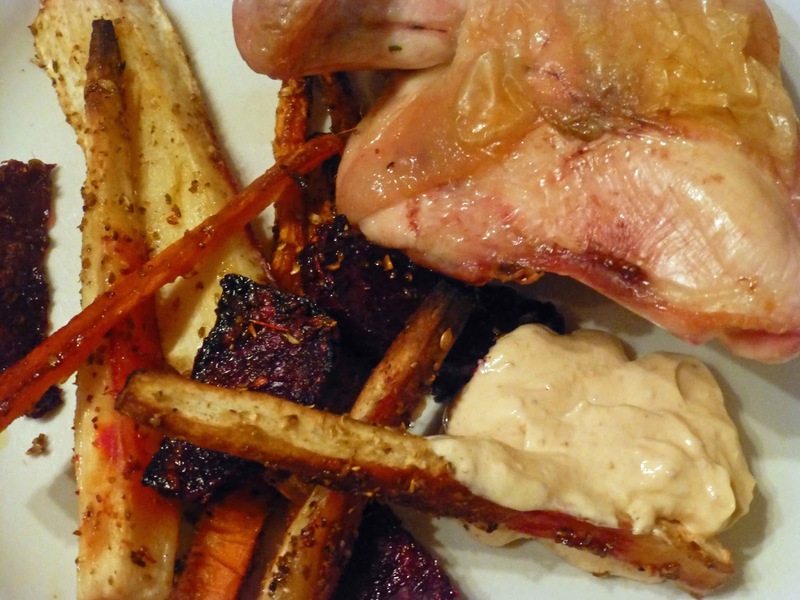 We picked out two of the recipes as the basis for a Saturday night dinner: the Baba Ganoush and a Roasted Vegetable Salad with Spicy Yogurt dressing. The Harissa was required for both. You can access the cookbook, including recipe details and method, online here. 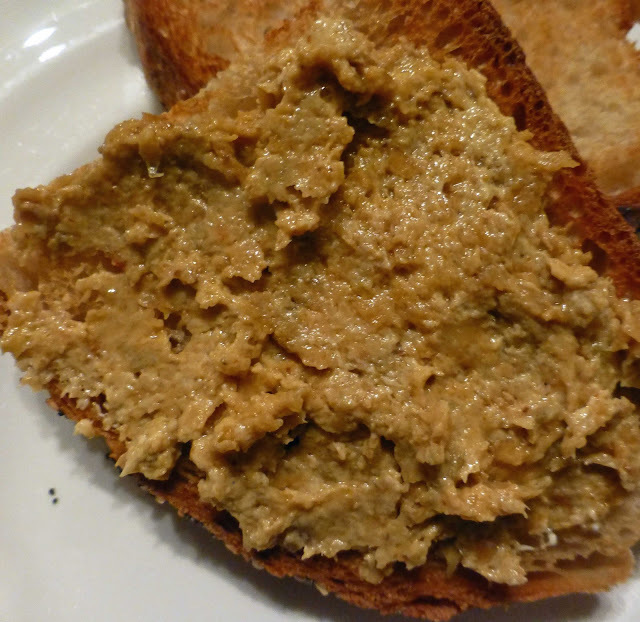 As most of you know Baba Ganoush is based on aubergine and the less usual ingredients are curry powder, the harissa and hazelnut oil (we used Ballyhoura mushroom oil). And the secret ingredient was some Glenisk Organic Greek Style Natural Yogurt which, added to the mixture when cool, gave it a creamy texture. No flatbreads handy but we spread it on toasted Arbutus Sourdough from Bradley’s and, with a bowl of salad, it was perfect. Probably the hardest part was all the maths, cutting down the ingredient quantity from 6-8 to just two! So on to the main course. 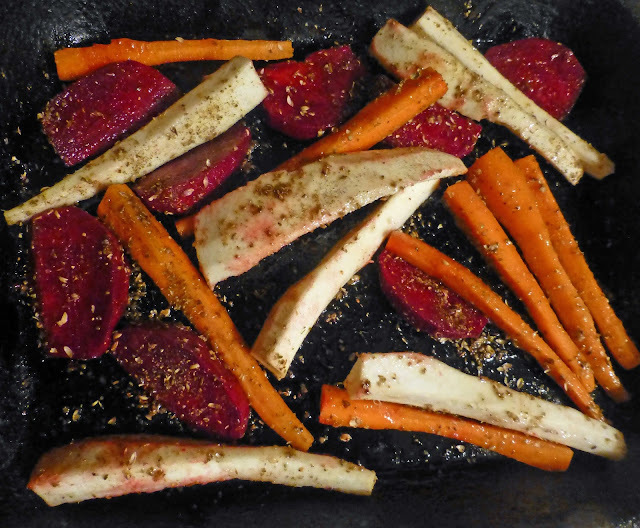 The vegetables to be roasted were carrots, parsnips and one of the last beetroots from the garden. Coriander seeds (blitzed) and cumin seeds were added before roasting. The spicy yogurt dressing consisted of the same yogurt as previously, harissa paste, lemon and sea salt. And, to make it a main dish, we added chicken breasts (with bone and skin) from the Chicken Inn. Again, it all worked out very well indeed. Without the chicken, it is a lovely salad for these winter days and the dressing can also be used as a dip. The booklet may be slim but it is packed with recipes, close to twenty in all. Our next target will be the Moussaka. A couple of possible desserts are included but we gave the cook a break and bought a selection of Turkish Delight from The Sultan in McCurtain Street. Could also had purchased some of his baklava. Tang opened earlier this year in Dublin and has been very successful indeed. They combined with Glenisk last Friday for a fund-raiser for Syria. Owner Stephen Dwyer says they are regularly asked for recipes (by head chef Jess Gavin). And this book contains some of the favourites and features the Glenisk range of yogurts. Enjoy! We did and we will! 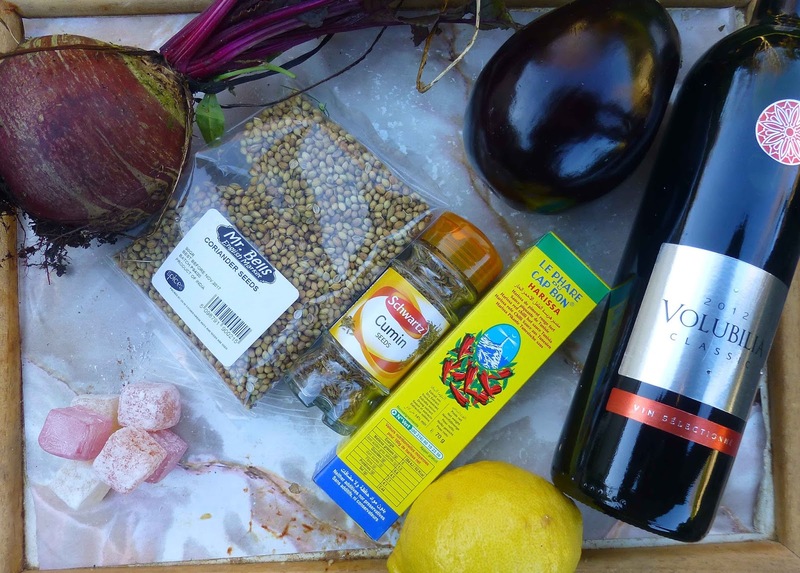 Some of the ingredients, including beetroot from the garden and wine from Morocco. September had its miserable strictness of school’s restart and freedom’s loss, its watery, mocking sun, and its big anti-climaxes above in Croke Park, but it also had tarts and crumbles made with the finest of Mothers’s own apples that were still ripening an hour before, and that nearly made up for everything. 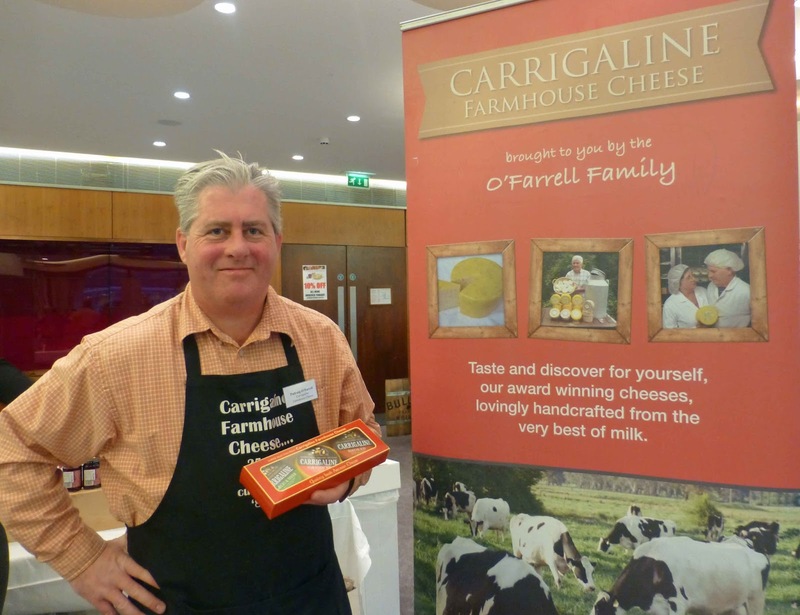 With Cork Cheese Week on (big weekend coming up at Cork Airport Hotel), I thought you might like to read this 2016 post on Cashel Blue, one of the cheeses featuring this week. 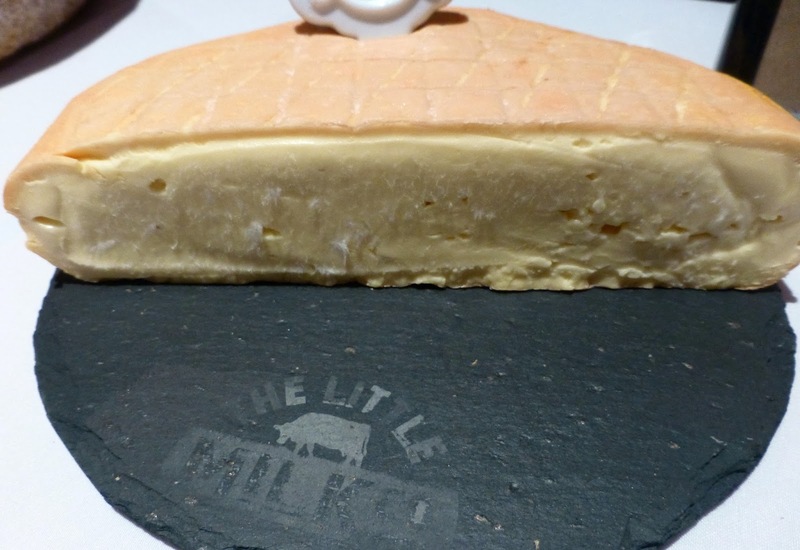 When you listen to Sarah Grubb speak about cheese and particularly about the cheeses that her family produces, including the famous Cashel Blue, you hear passion (and the occasional hearty laugh). 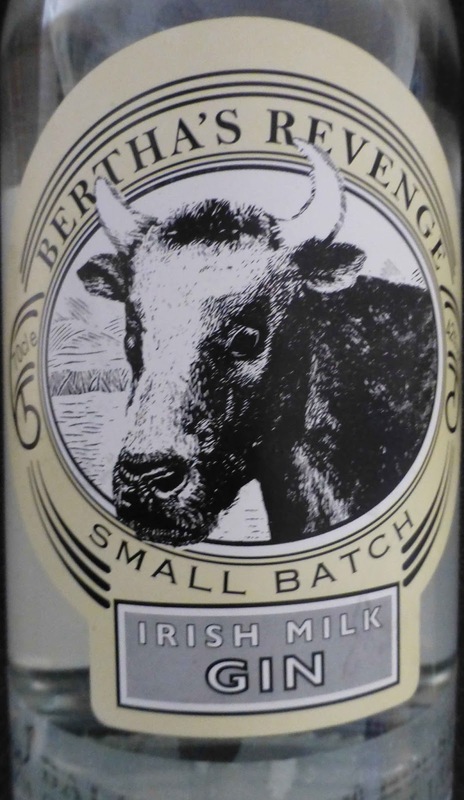 But listen carefully and you realise that the passion is built on attention to details, little and large, and on hard work, on experience of course and also on a love for the locality, their terroir, the green fields of Beechmount Farm where their “new” dairy (2010) is located. If the planners had their way, the building would have been on an industrial estate. 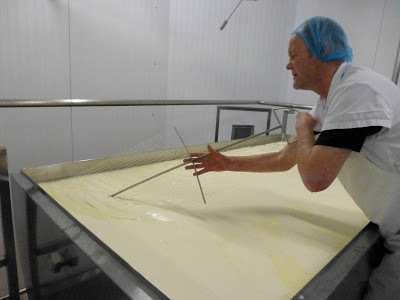 But the Grubbs (including founders Jane and Louis, Sarah’s parents) were convinced that the dairy should be on the farm, in the place where the cheese had been made since 1984 and in the very area where their own workers came from. And, with help from friends and neighbours, that is what happened. 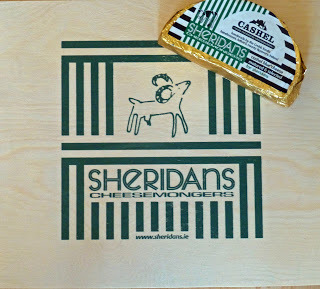 Cashel Blue is featured in the new Oxford Companion to Cheese. The book tells us that Cashel Blue has an ivory interior when young, which gradually deepens to a warm buttery yellow as it matures. Its thin, uneven streaks of blue give it a marbled appearance. 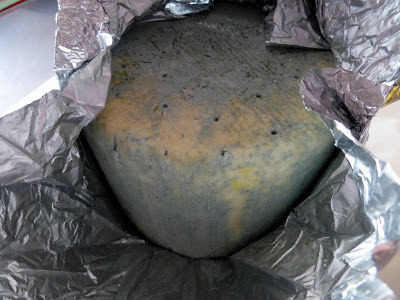 Beneath the tinfoil wrapping is an edible, sticky, blue-gray rind with some white mold, which is intrinsic to the cheese, contributing to the breakdown of the curd and adding flavor and complexity. The book is published in America, hence the gray and flavor etc. Goat's milk, she told us, is closer to buffalo than sheep (which is creamier). And, Sarah (who like husband Sergio, another key player at Beechmount) has a wine background, emphasized that sheep’s milk is a product of its terroir. “It varies from place to place. Fascinating!” And another thing, sheep’s milk is easier to digest. This is Jane Grubb telling how Cashel Blue cheese came into being and we do agree, as do thousands of customers worldwide, from the US to Australia. 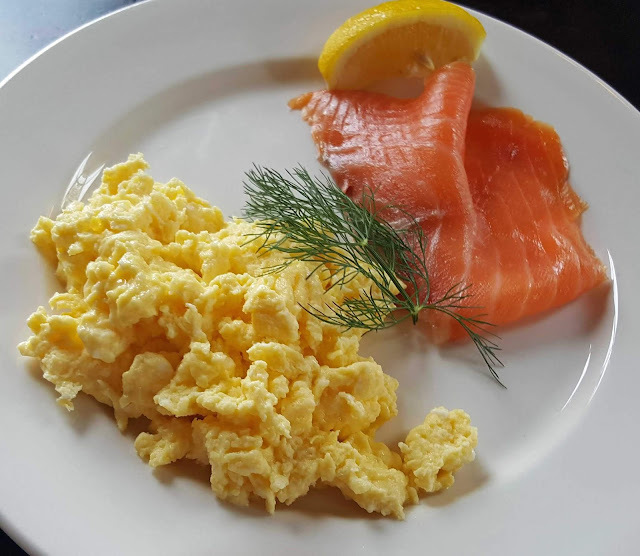 “All areas of the market are supplied," Sarah told me they don't put all their eggs into the one basket! This is a deliberate decision, as they want everyone to try their cheese, not just those that shop in elite outlets. I should of course say cheeses as Cashel Blue has been joined by other products, most notably Crozier Blue, developed in 1993 from sheep’s milk. But back to Jane and those early days. She had decided to make cheese but didn’t know how. So she got herself a library book. Even that wasn't available locally and had to be obtained via the inter-library route. That book, lots of experiments and then the acquisition of a small vat, led to the famous Cashel Blue. Over twenty years later, the new dairy was established near the original farmhouse (which had become almost overwhelmed by the success) and opened right in “one of the best fields” and locally became known as Louis’ shed. Louis is Jane’s husband and the entire family were glad to get their home back. The early cheesemakers too needed encouragement as they tried to find their way. And that encouragement came in the shape of an early prize (up in Clones in County Monaghan) and soon they were on the right path, choosing to make the blue rather than what many others were making. The cheesemaking operation at Beechmount Farm was in good hands from the start with Jane and her husband Louis the pioneers and is in good hands now and for the future with Sarah and her husband Sergio Furno and their team. The The Oxford Companion to Cheese is due to be published on December 1st. 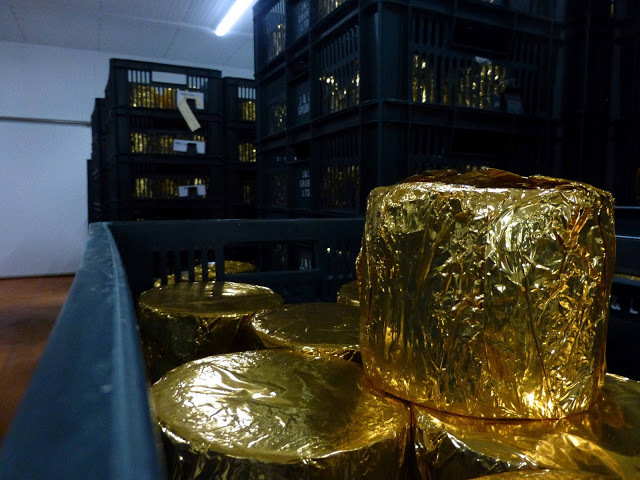 The 1084 page book, edited by Dr Catherine Donnelly, is the first major reference work dedicated to cheese and contains 855 A-Z entries in cheese history, culture, science and production. The most comprehensive work on cheese available has drawn on an astonishing 325 authors (from 35 countries), from cheesemakers and cheese retailers to dairy scientists, microbiologosts, historians and anthropologists. 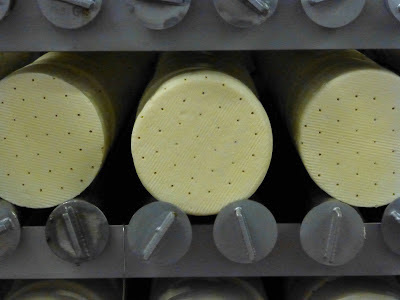 It is a landmark encyclopedia, the most wide-ranging, comprehensive, and reliable reference work on cheese available, suitable for both novices and industry insiders alike. We'll have more on and from the impressive book in the coming weeks. 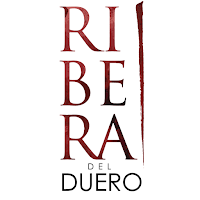 Wine has been produced in the beautiful wine region of Ribera del Duero since Roman times, though it became well known outside of Spain only in the 1990s. Just two hours north of Madrid, there are over 270 vineyards following the banks of the Duero River in the Castilla y León region, a flowing swathe of land that’s approximately 115 kms long and 35 kms wide. According to the World Atlas of Wine, there were just 24 bodegas in the region when the DO was created in 1982 and now there close to 300. You’ll find big companies there, such as Faustino and Torres, and many smaller outfits. And there are many small growers who sell their grapes to the winemakers. Earlier in the week, at Cork’s Farmgate Cafe, Agustin Alonso González, Technical Director of D.O. 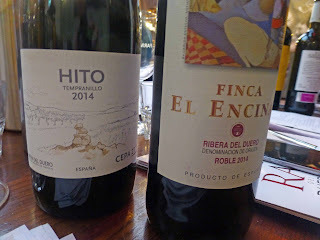 Ribera del Duero and Vicente Marco Casamayor, the D.O. 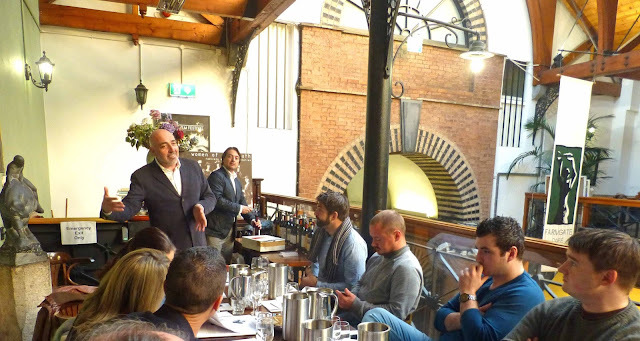 Ribera del Duero Director of Communications, led a tasting masterclass, ranging from the young ‘Joven’ wines to the ‘Reservas’ – wines of exemplary depth and balance, powerful and elegant, and great wines for food. There is of course more than one answer, though Alonso says that the average altitude of 850 metres “says everything”. The best wines are often made in extreme conditions, on the edge between possible and impossible. And Ribera is on the edge, certainly in terms of frost - they get a lot of it in the spring. Indeed, the rule, he said, is that you must have 200 frost free days per annum to make wine; they get a few less than that. Temperatures in summer can see big variations between the heat of the day and the cool of the night. And even more so between the summer (up to the mid 40s) and winter (down to minus 20). 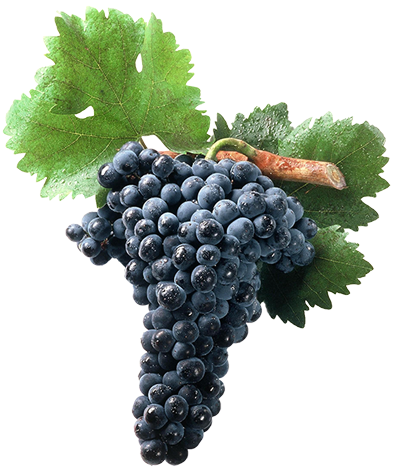 While other grapes are grown here, Tempranillo accounts for 96.5% of the harvest. Known locally as Tinta del Pais, the berries are smaller with a thicker skin. 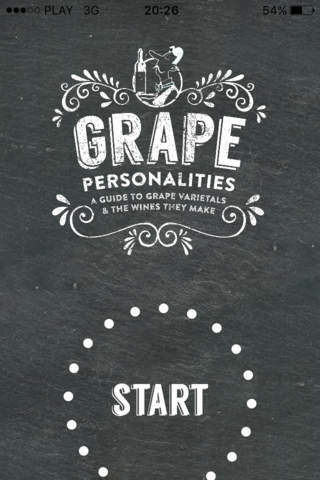 Because of the different proportion of fruit to skin, “it is better to make richer wines”. By the way, the DO does not include white wines, just rosé and red. At The Farmgate, we would soon find out how good the wines were. 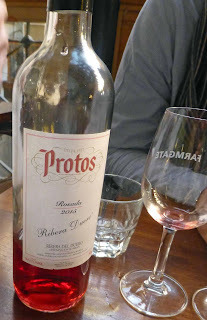 We started off with a rosé and a few of the younger wines before moving on to those normally drank with food including a lovely Emilio Moro 2014, the “very typical crianza” produced by Valduero, and the Protos Crianza, “a very classical wine, French style, from the complicated harvest of 2013”. At this tutored stage of the tasting, we had about ten wines and naturally finished with the best. I thought so and so did a few close by. Here are my top three, in no particular order. Resalte Crianza 2011, a renowned wine say the producers; an exceptional vintage from a very hot year, according to Alonso. It has spent 14 months in oak (80% French, 20 American) and the promise of its “ripe fruit and typical oak aromas” is carried all the way to the finish. A powerful well-balanced wine with great potential for ageing (another feature of Ribera wines). Pradorey, from Finca La Mina, was another star, this a reserva. This has spent 18 months in American oak, 6 in Nevers oak vats. “Iron fist in a velvet glove” was the phrase used on the day and its not too far off. It impresses all the way through, a gorgeous bouquet, fresh, balanced, silky on the palate and a long finish. And like the Pradorey, the Protos Reserva “can last another 25 years”. This has been aged 18 months in oak and 18 in bottle. It has a beautiful “typical” cherry colour, a complex nose (includes jammy red fruits) and a powerful silky presence on the palate. Soft but with good acidity (for the food!) and a “lingering finish”. Superb. A good one for Christmas (although it was the Fournier Spiga 2010 that Alonso recommended for turkey! That ended the “formal” part of the afternoon and then we tucked into a few nibbles from The Farmgate and tried a few other wines that were open. Here, I noted the aromatic Verónica Salgado Capricho Crianza 2012 as a favourite for its rich and vibrant palate and a long finish. 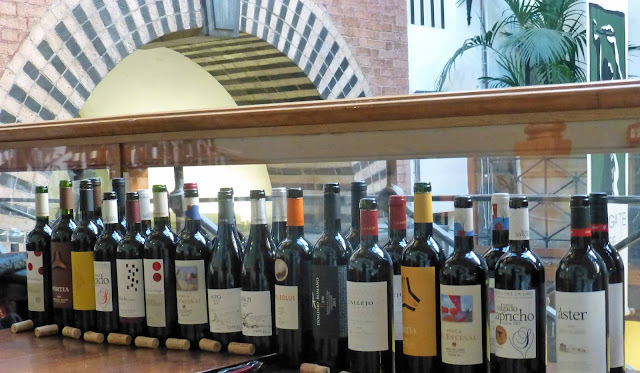 No shortage of good wines from “the modern red wine miracle of northern Spain”, a title bestowed on Ribera byThe World Atlas of Wine. Thanks to Wines of Spain, the Ribera DO, and Host & Co. for organising the opportunity and to The Farmgate, led by Mirko, for hosting. The Farmgate. Bodega for a day. 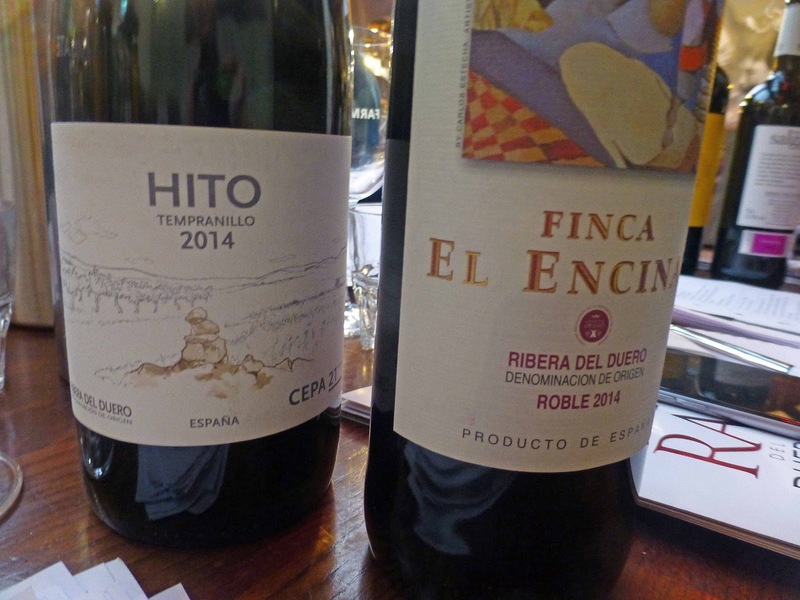 How did Ribera do in the 2016 vintage? The full harvest story from Spain here. 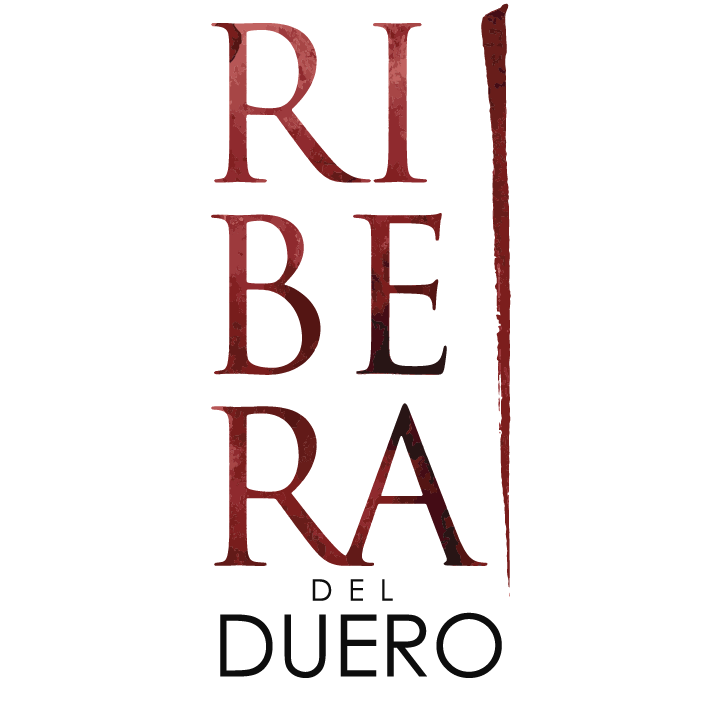 Read all Ribera's Alejandro Fernández here, making wine his own way since 1975.